It used to take years or even decades for disruptive innovations to dethrone dominant products and services. But now any business can be devastated virtually overnight by something better and cheaper. How can executives protect themselves and harness the power of Big Bang Disruption? Just a few years ago, drivers happily spent more than $200 for a GPS unit. But as smartphones exploded in popularity, free navigation apps exceeded the performance of stand-alone devices. Eighteen months after the debut of the navigation apps, leading GPS manufacturers had lost 85 percent of their market value. Consumer electronics and computer makers have long struggled in a world of exponential technology improvements and short product life spans. But until recently, hotels, taxi services, doctors, and energy companies had little to fear from the information revolution. Those days are gone forever. Software-based products are replacing physical goods. And every service provider must compete with cloud-based tools that offer customers a better way to interact. Today, start-ups with minimal experience and no capital can unravel your strategy before you even begin to grasp what’s happening. Never mind the “innovator’s dilemma”—this is the innovator’s disaster. And it’s happening in nearly every industry. Worse, Big Bang Disruptors may not even see you as competition. They don’t share your approach to customer service, and they’re not sizing up your product line to offer better prices. You may simply be collateral damage in their efforts to win completely different markets. The good news is that any business can master the strategy of the start-ups. Larry Downes and Paul Nunes analyze the origins, economics, and anatomy of Big Bang Disruption. They identify four key stages of the new innovation life cycle, helping you spot potential disruptors in time. And they offer twelve rules for defending your markets, launching disruptors of your own, and getting out while there’s still time. Based on extensive research by the Accenture Institute for High Performance and in-depth interviews with entrepreneurs, investors, and executives from more than thirty industries, Big Bang Disruption will arm you with strategies and insights to thrive in this brave new world. 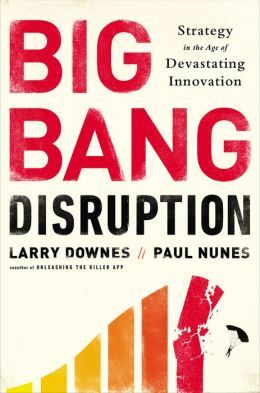 Posted on July 25, 2014, in Inspiration, Required Reading and tagged big bang disruption, larry downes, required reading, Required Reading for Entrepreneurs. Bookmark the permalink. Leave a comment.